Great for decorating tables and windows. White nylon may be dyed any color. Approximately 1 lb. 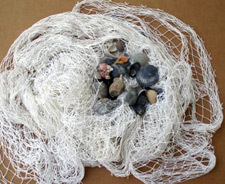 of netting, enough to very generously decorate a wall or table. (tapers to one mesh on each end, middle (longest) portion about 6 ft. in depth and approx. 8 ft. long) We sell this all the time to local seafood restaurants (we are only 10 miles from the beach!) and customers for decorating their condo and beach houses. 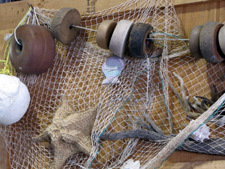 At various times we have used floats, very inexpensive. Decorators welcome. Call if you have any questions: 1-800-211-0518.